GHOST FORESTS ARE EERIE EVIDENCE OF RISING SEAS | "Global Possibilities"
Jennifer Walker stepped off her kayak into a wall of riverside grass. She steadied herself and stooped to scoop soil into a jar, then disappeared into the thicket for more. 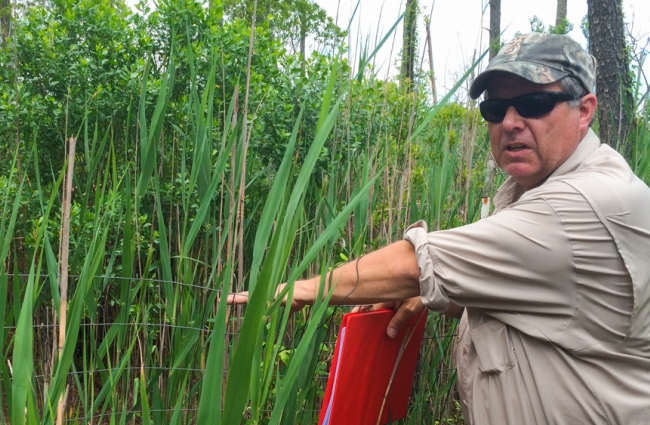 Analysis of amoeba fossils in the researcher’s samples may help to explain why, jutting above the head-high marsh grass a couple hundred feet further back, a cedar forest was dead. Bare trunks of dead coastal forests are being discovered up and down the mid-Atlantic coastline, killed by the advance of rising seas. The “ghost forests,” as scientists call them, offer eerie evidence of some of the world’s fastest rates of sea-level rise. Forests provide habitat and protect against global warming, but they’re declining worldwide because of land clearing, fires, disease, and invasive species. 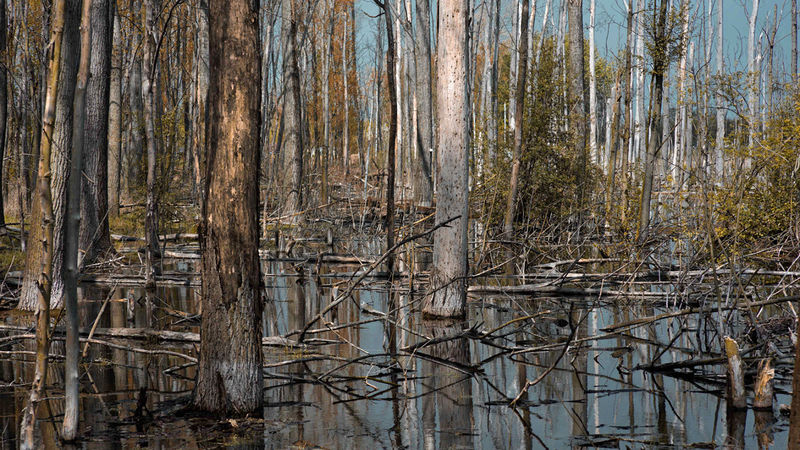 The ghost forests show sea-level rise can be yet another cause of deforestation. Climate scientists like Walker, a PhD candidate at Rutgers University researching sea-level rise, have begun investigating these dead forests, which are becoming common features along some coastal landscapes. The poison that kills the trees is salt, delivered to their roots by rising tides. Stands of dead trees have been used by scientists for decades as evidence of past environmental tumult. When submerged in seas and lakes, dead trees have revealed to scientists the details of prehistoric changes in water levels. Seas are rising worldwide because of the warming effects of greenhouse gas pollution from fossil fuels and farms. Several feet of sea-level rise is projected this century as the pace of climate change accelerates. That rise will inundate infrastructure, homes, and ecosystems. Efforts to switch to clean energy, protect forests, and revamp farming and transportation could curb the inundations ahead. The mid-Atlantic coast is sinking faster than nearly anywhere else. The Gulf Stream has been shifting northward, bringing warmer water to the region, accelerating sea-level rise. Meanwhile, groundwater pumping and natural geological processes are causing lands to sink. High tides rose here by several inches during a recent decade. That was more than three times faster than the average rate of sea-level rise worldwide, simulating conditions expected globally during decades to come. 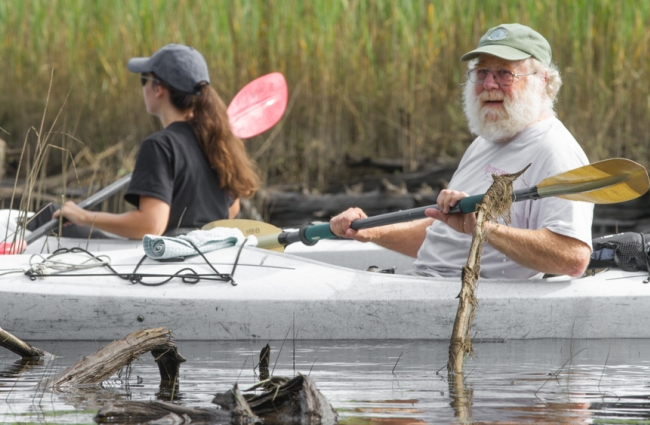 Walker is part of a team that has begun investigating the ghost forests along the estuaries of southern New Jersey, accessing research sites using trucks and kayaks. Similar forest diebacks have been documented in Canada and Louisiana and monitored in wildlife refuges in Maryland. The botanical corpses occasionally topple during storms, becoming crisscrossed logs, which are slowly buried beneath the muck of marshes. Those marshes can migrate inland as seas rise. 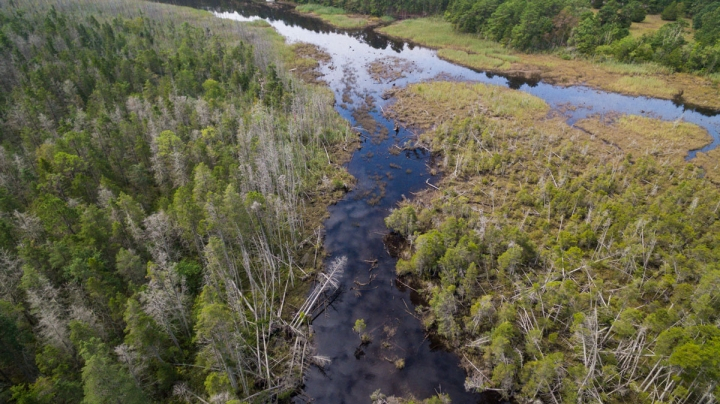 “Those trees die back and it converts to a tidal marsh,” said Matt Whitbeck, a biologist at the Blackwater National Wildlife Refuge in Maryland, where rising seas have killed several thousand acres of forest since the 1930s. 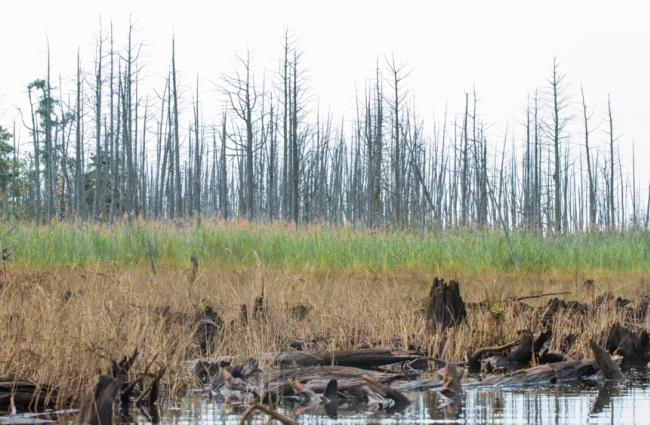 Preliminary findings from an analysis by Virginia Institute of Marine Science (VIMS) scientists suggest 100,000 acres of coastal forest may have died off around the edges of the Chesapeake Bay since the 1850s. Much of the dead forest has now been replaced by marshland, while former marsh areas are now open water. Overall, the changes are diminishing the ability of plants in the region to fight global warming by absorbing carbon dioxide. The VIMS research has focused heavily on Goodwin Island, a windswept study site near the mouth of the Chesapeake. Accessible only by boat, the undeveloped island contains hundreds of acres of forests and marshes — teeming with tiny crabs and even tinier ticks. The ghost forests are visual testaments to the power of rising seas in refashioning environments and ecosystems. With mapping and radiocarbon dating efforts planned by Rutgers, combined with soil sampling and other approaches for studying landscapes, these ghost forests could reveal the history of the region’s shorelines. Horton thinks many of the ghost forests of New Jersey that are still standing died during the past century. Sticking out of the mud of rivers and riverbanks are the stumps of trees that may have been killed hundreds of years earlier. Forest die-offs from rising seas occurred in centuries and millennia past when New Jersey was a natural wonderland, when forestlands could migrate upland as salty water brushed their subterranean toes. Now, though, New Jersey’s forests are boxed between shifting shores and farmland. Like forests elsewhere, these woodlands shelter wildlife and are popular with hunters and hikers. They help slow global warming by sucking up carbon dioxide pollution. As seas continue to rise, they seem certain to continue killing coastal forests, leaving only the specters of logs behind. In New Jersey, as elsewhere, that will mean less forestland — unless humans or nature find ways of fostering seedlings in fields currently used for farming.